Winter rolled into New Jersey last week with a blast of Arctic air and the season’s first snowfall. The snowbirds have already migrated to warmer climates. The sand and sun crowd are busy hibernating in front of their televisions. Braising is by far my favorite cooking method. It transforms the toughest cuts of meat into tender and gelatinous morsels by exposing them to low moist heat for extended periods of time. The results are unsurpassed in richness, texture and flavor. I would choose a braised cut of meat over a Fillet or Prime Rib anytime. 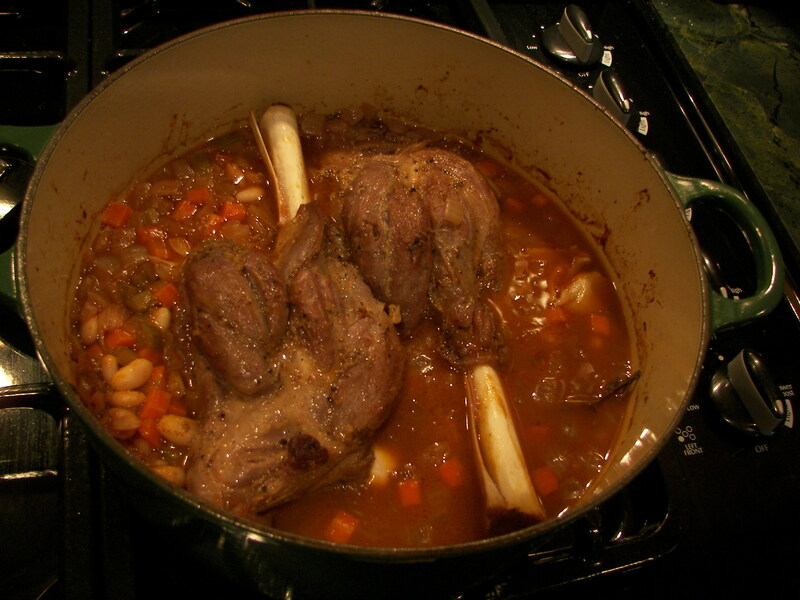 The lamb Shank recipe below is a good example of braising and a relatively easy version of a classic French dish. It requires about 3 hours of cooking time so plan ahead and start early. 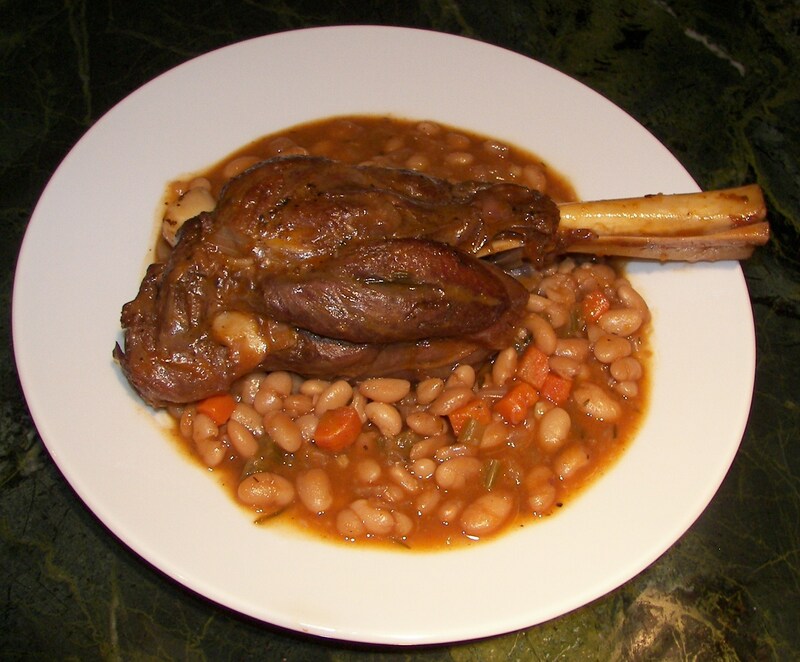 Both Lamb and Beans are cooked in the same pot so the kitchen mess is minimized. It is the perfect dish for a cold winter’s day. The recipe yields 2 servings. 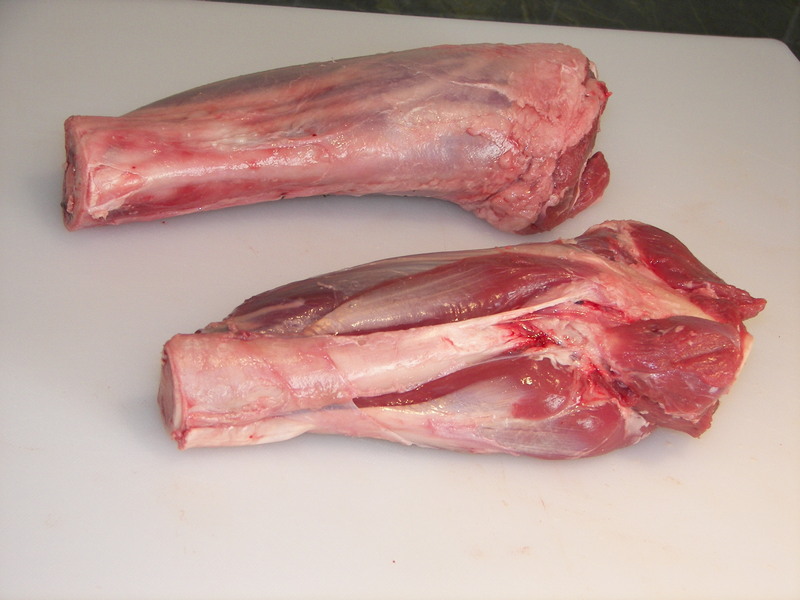 Lamb shanks are not lean cuts of meat. 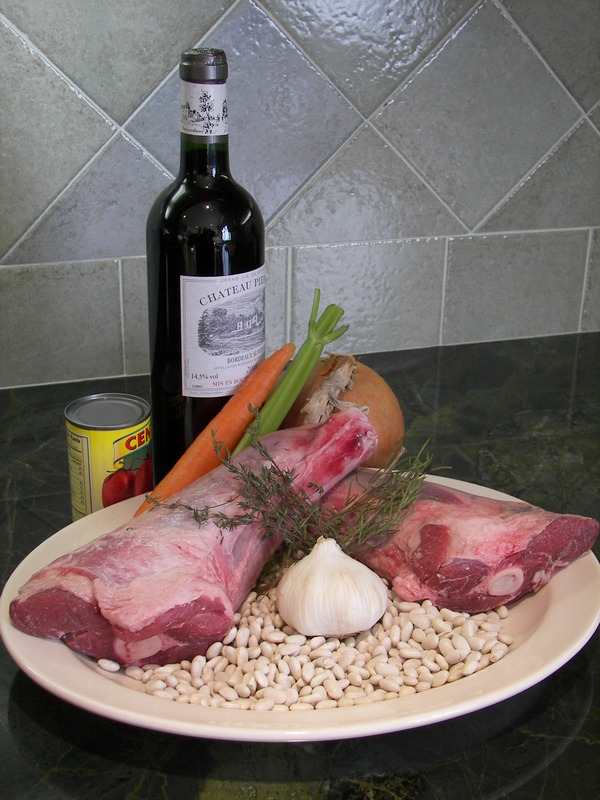 The fat content in the dish must be counterbalanced by the red wine’s acidity or else it will taste bland and flat. A Cote du Rhone is a good choice. Mourvedre and Cinsaut grapes are used to make this wine. They tend to be higher in acidity than other varieties. Place beans in colander and pick through them removing any foreign materials encountered. Place beans in stock pot. Add 4 quarts of water and 3 tbsp of salt. Place pot containing salted water and beans on the stove over high heat. When water begins to boil, turn off heat, cover pot and let stand for 1 hour. Cut the onion, carrots and celery into small dice. The size should be slightly larger than the beans being used. Trim as much fat and silver skin from Lamb shanks as possible. Note: Since this recipe is made entirely in one pot, whatever fat that is left on the shanks will render and stay in the dish. It could become a greasy mess if they are not trimmed properly. Don’t worry about the dish being too dry. The rich, lip-smacking quality will be achieved when the gelatin and marrow renders from the bone. Season the shanks with salt and pepper. Heat Dutch oven on top of stove over medium high flame. When hot, add vegetable oil and brown shanks on all sides. Remove shanks from pot and set aside. Discard all but 1 tbsp of fat from pot. Be careful not to remove the sucs (caramelized bit of protein) from bottom of pan. Lower the flame to medium. Add onions and sauté until translucent. Add carrots and celery. Continue sautéing until tender. Lower the flame to medium low. Add tomato paste. Stir briskly to mix tomato paste and vegetables together. Sprinkle flour over the vegetable-tomato paste mixture. Stir to incorporate. Continue stirring until no raw flour is visible. Raise flame to high. Add red wine and bring to a boil. Stir until the wine has thickened and taken on a smooth consistency. Lower the flame to medium. Add Chicken stock and stir until incorporated. Allow liquid to a simmer a few minutes while stirring. Lower the flame to medium low. Add beans, Garlic, Bay leaf, Rosemary, and Thyme. Stir to combine. Bring to a simmer. Place shanks into the pot, submerging them about half way into the beans. Cover the pot and place in the oven. The total cooking time will be about 3 hours. Turn shanks after the first hour has passed so the submerged side is now facing up. Replace cover and return to oven. Turn shanks again after the second hour has past. Cover and return to oven. Note: The beans should have the consistency of a thick stew at the end of the cooking process. 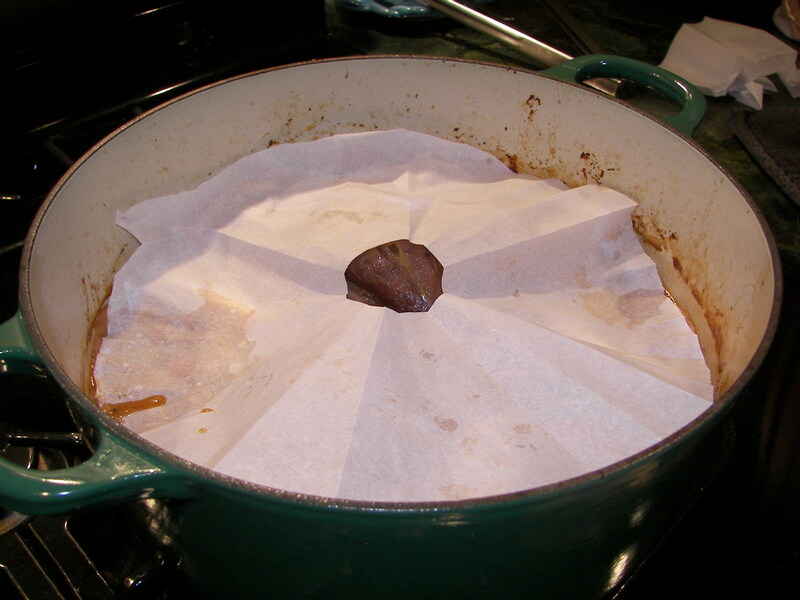 If too much liquid remains after two hours of cooking, replace the Dutch oven cover with a parchment paper lid (See details in Cooking Tips section) and continue cooking for the final hour. Check every 15 minutes of so to prevent too much liquid from evaporating. If this occurs, simply remove parchment paper lid and add enough water to reconstitute. Replace Dutch oven cover and continue cooking. Remove pot from oven after the third hour has passed. The meat on the shanks should be moist and practically falling off the bone. The beans should be thick, hearty, and rich. Remove shanks and taste beans. Season them with salt and pepper if necessary.